When I think of summer style, I think whites, soft neutrals and bright colors like hot pink, turquoise, yellow and orange. That’s why I fell in love with this top. 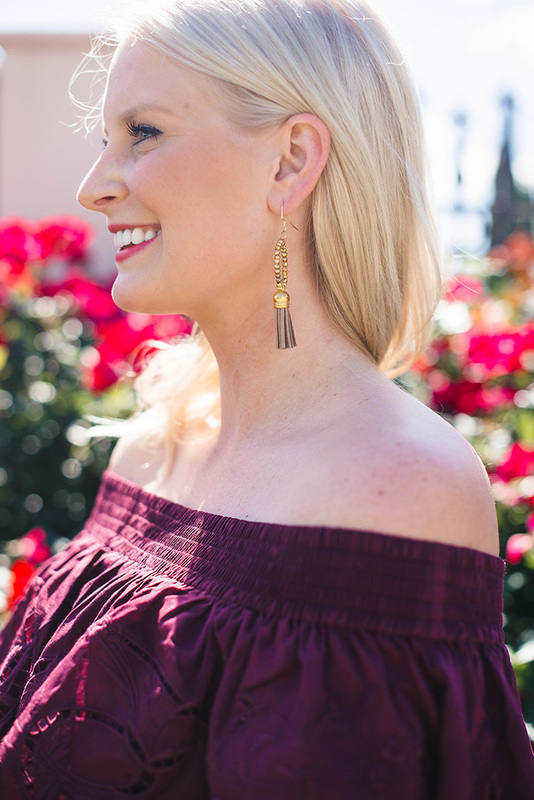 The gorgeous plum shade is very unexpected, but very much a summer look with the pretty embroidery and off-the-shoulder style. While white is definitely going to be a go-to this season, I’m excited to have something different in my wardrobe I can reach to when I want to stand out a little bit. Not only will it be a great piece for summer, this plum color is going to take me right into fall with my favorite jeans. It’s just the kind of transitional item I always try to invest in – something that can be worn a million different ways and transcend the seasons. I’m thinking I’ll wear it next with my new white jeans on my upcoming trip to Carmel in June. Chic! Tibi’s got a bunch of pieces in this rich shade for the summer season. A few more to discover include the dress version of this embroidered top, this simple silk tank, all-over sequin culottes (for you adventurous gals), and this more minimalist off-the-shoulder dress. love this top, the color is perfect. Um, this top is everything! Gorgeous color on you! I love all of your off-the-shoulder styles, I really need to start shopping for some. Love that top! Such a pretty color! And I’m coveting that gorgeous bag!! I LOVE this outfit and definitely need this top for upcoming Texas A&M football games. Well this is just the perfect summer outfit! Skinny Minnie! I stopped browsing Tibi for god knows what reason last fall, but I definitely need to check out their new arrivals! 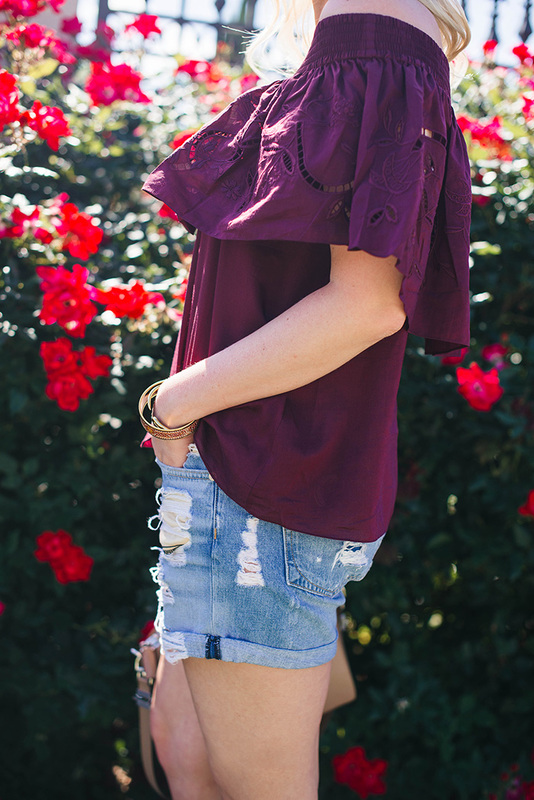 The off the shoulder trend mixed with the deep burgundy color, perfection! What a perfect outfit for the summer! Such a gorgeous color on you!! 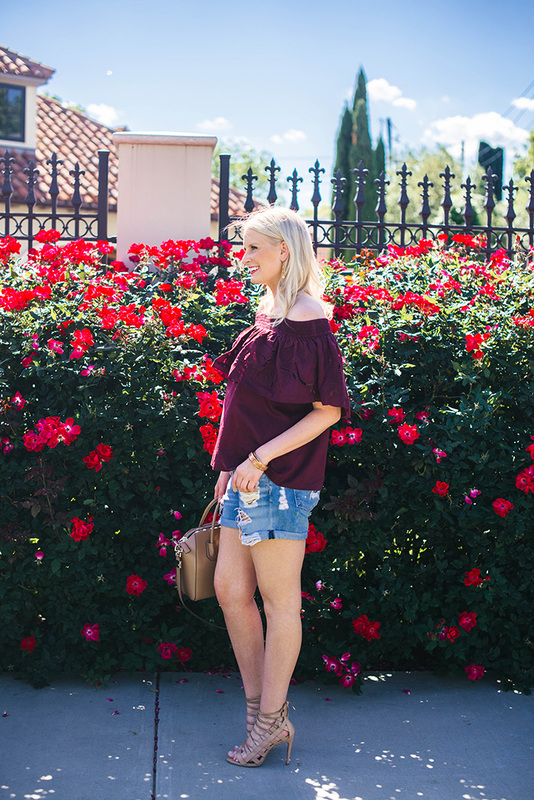 I’m a sucker for the off the shoulder/denim shorts combo…so perf for summer!! 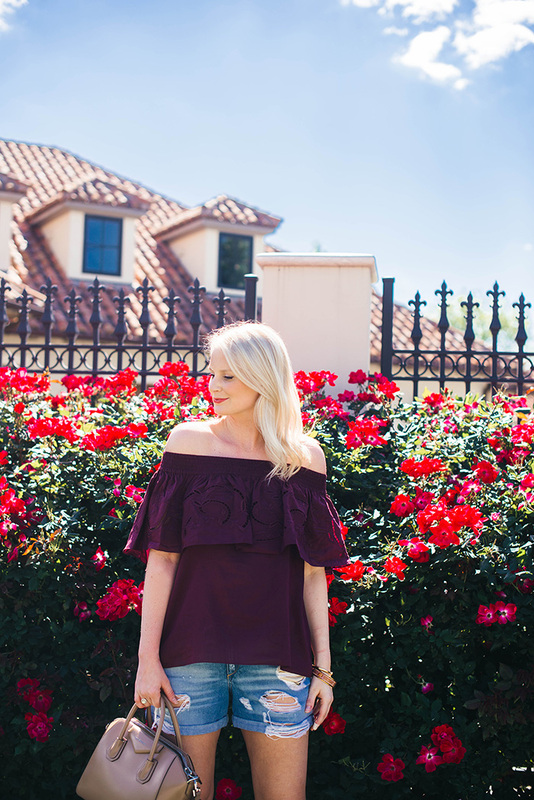 this purple off-shoulder top is so pretty on you and love the flowers in the background! girl legs be looking GOOD! Do you do any sort of tanning?? What a beautiful top! I love the color and the lace details. Very nice ensemble! Love the top! Love this top! Off the shoulder shirts are my go to look this season! These photos + this outfit are so gorgeous!! Looove this look! That top is so so beautiful, love the detail along the ruffle! you look stunning, Merritt! That top is perfection! Such gorgeous photos & outfit!